Ask the hauler what their feed and water policy is for long-distance hauling. If a hauler simply says that they provide feed and water, that is not enough. Horses often refuse water while en route. 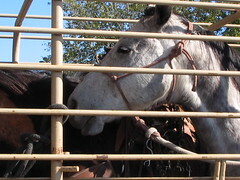 It is not uncommon for a horse to become dehydrated during transport. Look for a service that includes stops every 3 to 4 hours so your horse will have a chance to rest and rehydrate. Verify the transportation schedule. Look for a hauler who can meet your deadline. However, make sure that you and the transportation service account for rest stops and overnight rest. Providing sufficient rest for both the driver and your horse helps ensure your horse arrives safely. Ask to see the equipment used to haul your horse. Will your horse be in a separate stall with no contact with other horses? Is the trailer enclosed for winter travel or well vented for summer travel? If you have the opportunity to see the transportation provider’s, perform the same type of check of their equipment that you would of your own. Check the tires for sufficient tread. Ask to see a road-side safety kit. Check the trailer for solid flooring. Reputable transporters will be happy to walk you through their truck and trailer and answer your questions. Ask the provider for references. It is not enough to see the testimonials that the provider lists on their webpage. Ask for contacts and follow-up with those contacts. Especially seek references from people who’ve used the transporter for similar jobs to the one you need. If you are having a mare and foal delivered, ask for references of other mare and foal deliveries. A reputable transportation service will gladly answer any of your questions and show you their equipment. Don’t be afraid to ask questions, you are placing precious cargo in their hands. Probably the most important features that will determine how well your horse travels are the features of the stalls. How many stalls are included? What size are the stalls (length, height, and width)? If your horse’s ears are touching the ceiling of the trailer, it is probably too short. Also, be sure the horse will have room to turn around for exiting. Some horses can be very difficult when it comes to backing them out of a trailer stall. Be sure there’s plenty of ventilation for each stall. Horse trailers usually have from two to nine stalls. It’s a good idea to get a horse trailer with one extra stall than what you actually need. This will provide more room for your horses and also allows you to add another horse in the future. 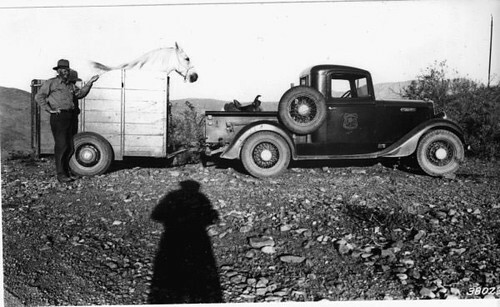 Horses are like people in some ways… they seem to have their own preferences when it comes to horse trailers. They especially have their own preferences when it comes to stepping up into a trailer and/or walking up a ramp into the trailer. This makes choosing a horse trailer difficult because you might not be sure which method of loading your horse would feel more comfortable with. Before you start shopping, find a couple of friends with horse trailers of different styles and ask if you can do a test load with your horse. You might be able to find out ahead of time what type of trailer will work best for your horse. Consider all these features when shopping for a trailer, and go online to compare horse trailers and brand names such as Sundowner horse trailers. You can search for trailers by brand name or by location and state. For example, if you live in Tennessee, you might search for “horse trailers in Tennessee” or “Sundowner of Tennessee.” You can also find used horse trailers for sale if you’re on a tight budget. Recently country entertainer Carrie Underwood announced she was recording Motley Crue’s song “Home Sweet Home” for American Idol and that a portion of the sales would go towards the Humane Society of the United States to find dogs home. This is a popular misconception to those donating. The fact is the HSUS is once again being investigated for misuse of funds following large amounts of money raised in the wake of hurricanes Katrina and Rita. There was also the matter of raising money for Michael Vick‘s pitbulls then along with PeTA working towards legislation that encourages killing anything that looks like a “pitbull”. A bigger concern for livestock owners is that not only does HSUS not own a single shelter but they have you in their target scope. They demand perfection. Not almost, not the standards they themselves have but perfection. With 4 million head of cattle marketed last year five videotaped and presented as normal business appeared on many news shows and resulted in the largest beef recall in US history. There was no timestamp to give any documentation but four out of thousands of sale barns failed and it is presented against all cattlemen. The Humane Society of the US gets major publicity with a tape of cruelty to cows (apparently they didn’t see to it that existing laws about cruelty were enforced) and on the website pushes…vegan and vegetarian diets. Indeed they present snips of quotes showing that HSUS, USDA and the American Dietetic Association are all in agreement that vegetarian is better. Indeed “Each industry has its own abusive practices and some are much crueler than others” before citing poultry, egg and pork industries are even worse than cattle.” Americans removed from their agricultural roots know nothing about farming and this is used by equating cattle and pigs with the family dog. By representing all animal industries as ‘factory farming’ from poultry to aquatic and dairy to veal it with one broad stroke paints all farms the same. It talks of “cage free” in passing but better is to be vegetarian. It represents that there are no statutes for cruelty on farms, despite cruelty statutes that have been used to prosecute serious cases of abuse. Shipping is a prime target as no matter species it is stressed they have no food, water or protection from heat/cold during the trip nor does it mention some might be an hour or two while other trips are longer. From abuse of transporting day old poultry in extreme temperatures to the recommendation of “sticks and electric prods should never be used to handle of move cattle” their recommendations are clear. It places responsibility for safe arrival on driver skill without regard to other possible factors. Beef cattle issues are referred to the same information. In a graph showing housing of dairy cattle it shows USDA statistics that 49.4 % of operations use pasture for any length of time for lactating cows and 60.1% for dry cows, yet focuses on 9.9% primarily using it, showing that 90% therefore don’t allow pasture at any time in the cow’s life. It further shows that 49.2% of operations house lactating cows by tie stall or stanchion, leaving the reader to think millions of cattle are tethered their entire lives without being to move or turn around. There are bad places in every industry but representing it as normal and a means to shut it down while, on other fronts NAIS and a new food safety regulation program seeks to shut down the smaller producers as well as anyone raising their own food it leaves a question. Who will feed America when small producers can’t and large ones are shut down?